LOS ANGELES, Calif. — Felipe Esparza took his experiences as a Latino single dad from the Pico Garden housing projects and turned them into hysterically funny but salient commentary. Fast forward years later, and the Mexican-American comedian's latest show,“Felipe Esparza: Translate This,” will premiere on HBO on Sept. 30. Esparza, along with his wife, Lesa O'Daniel Esparza, and Christopher Smith are the executive producers of the "Translate This" HBO Special. "My wife is my business partner and manager. We saved up some money, and we got a crew together, and we did the whole thing,” Esparza told NBC News. The winner of “Last Comic Standing 2010,” Esparza, 49, says he didn’t choose stand-up, it chose him. 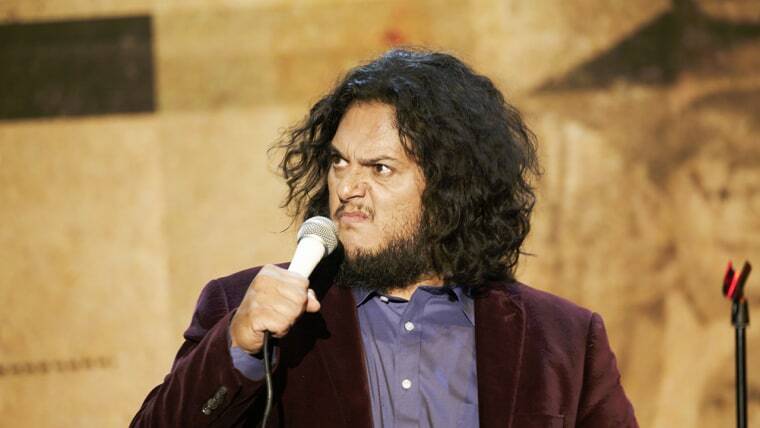 Esparza has appeared on numerous TV shows, including "Superstore" (in a recurring role), "The Tonight Show," "Lopez Tonight," "Premium Blend," "The Eric Andre Show," "Comic View" and Galavisión's "Que Locos," where he made more appearances than any other comedian. His film credits include "The Deported" and "I'm Not Like That No More," a feature based on his stand-up comedy, as well as his first stand-up special, "They're Not Gonna’ Laugh at You." Esparza is also the host of the podcast “What's Up Fool?,” which he launched in 2014. In his early 20s, he struggled with drugs. He says it was Father Greg Boyle, the founder of Homeboy Industries in L.A., the largest gang intervention and rehabilitation and re-entry program in the world, who convinced him to go into rehab. Esparza says it was in rehab where he realized he wanted to be a stand-up comic. Someone came in to speak, and asked a group he was in to set five goals; they would use them to focus on for their recovery. Esparza says he remembers three; one of them was to be happy, the other was to go to Italy, because he enjoyed eating at the Olive Garden, and the last was to be a professional stand-up. Inspired by the greats such as Eddie Murphy, Bill Cosby, Paul Rodriguez, and Richard Pryor, he went to the library and checked out books on writing comedy, and rented videotapes. He turned to the “LA Weekly” to start looking for open-mic nights to try out his routine. He started at underground clubs and coffee houses. At the time of the audition, Esparza didn’t own a car. He says he decided to use his bike to get to the Improv in Hollywood for the tryouts. He said he didn’t want anyone to drive him home if he’d lost the competition, and see him get upset. "Then my son’s mother filed for child support, and took half of it tax-free. She became the ‘last baby mama standing,’” he joked. Despite the major win, when Esparza went on the road touring the U.S., he was worried about whether his genre of comedy — talking about being one of nine children, his ‘hood, and the gangs and violence he grew up surrounded by, would translate to all audiences. He knew he’d made it when he was on tour and looked out at the audience, he saw an older white couple sitting in the front row, wearing tee shirts that read ‘Team Felipe.’ “Paul Rodriguez was right. They crossed over to me,” said Esparza.